Amnesty International: Experts or Ideologues? Amnesty International claims to have a policy of “impartiality and independence,” central to efforts to “systematically and impartially research the facts of individual cases and patterns of human rights abuses.”1 This claim is important for the integrity of the organization, in particular since Amnesty’s reporting on countries and conflicts around the world has been criticized as lacking credibility and expertise. By stating such a policy, Amnesty tries to establish that its work meets standards of credibility and impartiality. In direct contrast to Amnesty’s claim, however, a number of researchers and other individuals who work with the International Secretariat and various country branches have clear histories as anti-Israel activists. In turn, they write analyses of Israel that are both inaccurate and blatantly prejudiced, with some referring to Israel as a genocidal-regime at the heart of global conspiracies. The Amnesty staffers discussed below exemplify the organization’s troubling ideological approach to Israel and retreat from the universal principles of human rights. As long as these individuals are involved in producing research publications, analyses, and other materials relating to Israel, Amnesty cannot be considered a credible or impartial party to the conflict. Deborah Hyams was hired in 2010 as “Israel, Occupied Palestinian Territories and Palestinian Authority” researcher. Hyams has an extensive background in radical anti-Israel activism, including acting as a “human shield” in Beit Jala (near Bethlehem) in 2001. In this capacity she occupied a home that was being used as cover for recurrent gunfire and mortar attacks aimed at Jewish civilians in Jerusalem. Her presence in the Beit Jala conflict zone was meant to deter Israel’s military response to these attacks.2 In other words, Hyam was willing to endanger her own life in order to prevent Israel from protecting its citizens from Palestinian terrorists. Kristyan Benedict, Amnesty-UK’s Campaign Manager, has an extensive history of anti-Israel activism and bias. Benedict’s criticisms of Israel are without nuance, and avoid a serious treatment of the country in the favor of bizarre and demonizing claims. 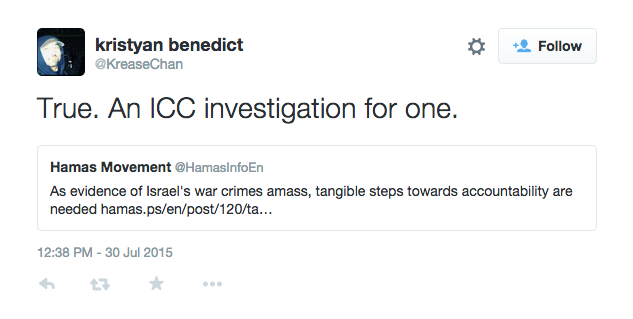 Benedict sees the Middle East through the prism of broad conspiracy theories, with Israel at the center. Amnesty-UK investigated the complaints. In December 2012, a “spokesperson confirmed that the investigation had now been completed and said the charity had decided that ‘the tweet in question was ill-advised and had the potential to be offensive and inflammatory but was not racist or anti-Semitic.’”25 It is unknown upon which criteria Amnesty drew its conclusions. There have been other instances of highly problematic Twitter activity by Benedict. In November 2014, he compared Israel to the Islamic State, by using the hashtag “#JSIL” on Twitter.Y26 The hashtag is used by extreme anti-Israel groups to compare Israel to the Islamic organization famous for beheading Western journalists and other atrocities. In May 2017, Allie McCracken was named Amnesty-USA’s North American Campaigner. From 2011 until the end of 2016 she was the co-Director27 of CODEPINK,28 a leader of U.S.-based anti-Israel BDS (boycotts, divestments and sanctions)29 campaigns, McCracken is also on the Board of Directors30 of Tree of Life31, an NGO highly active in promoting BDS. In September 2016, McCracken was scheduled to speak at a Capitol Hill briefing titled “What is BDS?,”32 discussing “why certain corporations and institutions are targeted for BDS actions, and the goals of the BDS movement.” The event was cancelled33 following the withdrawal of congressional sponsorship. Edith Garwood serves as Amnesty-USA’s “Country Specialist on Israel, Occupied Palestinian Territories, and Palestinian Authority.” AIUSA’s Country Specialists are unpaid volunteer leaders who provide expertise and strategy for a given country.58 Before joining Amnesty, Garwood volunteered as a member of the International Solidarity Movement (ISM),59 a group dedicated to provoking violent confrontations with Israeli troops and impeding their movements, often during anti-terror operations. Garwood was also a director of Palestine Media Watch-Charlotte (now seemingly defunct) and a member of Coalition for Peace and Justice (CPWJ).60 CPWJ provides funding to the anti-Israel, pro-BDS NGOs Badil, Israeli Committee against House Demolitions (ICAHD), and Sabeel.61 In 2010, Garwood presented at CPWJ’s Leadership Retreat62; in 2011, Garwood was a co-presenter63 at an event with Mary Lou Leiser Smith from CPWJ. The day before the delivery of the 2012 court decision of a civil suit filed by the family of Rachel Corrie, Garwood attacked the efficacy of the Israeli court system. Garwood refused to accept the notion that an Israeli court would review the evidence before it and come to an independent decision. Inigo Gilmore, “Israel protests as British women join ‘human shield,'” 29 Jul 2001, available at http://www.telegraph.co.uk/news/worldnews/middleeast/israel/1335737/Israel-protests-as-British-women-join-human-shield.html. “We’re not celebrating Israel’s anniversary,” The Guardian, 30 April 2008 available at http://www.guardian.co.uk/world/2008/apr/30/israelandthepalestinians. See NGO Monitor, June 04, 2012 “Breaking Its Own Rules: Amnesty’s Researcher Bias and Gov’t Funding,” available at http://www.ngo-monitor.org/article/breaking_its_own_rules_amnesty_s_gov_t_funding_and_researcher_bias. Cornell Daily Sun, August 30, 2001, “Local Groups Hold Interfaith Forum” available at http://cornellsun.com/blog/2001/08/30/local-groups-hold-interfaith-forum/. Badil, “Badil 2010 Annual Report,” page 7 available via http://www.badil.org/en/documents/category/56-annual-report. Richard Millet, Amnesty Event: “Israeli soldier used broken glass to cut Magen David into Palestinian boy’s forearm” April 13, 2011, available at http://richardmillett.wordpress.com/2011/04/13/amnesty-event-israel-soldier-used-broken-glass-to-cut-magen-david-into-palestinian-boys-forearm/. Marcus Dysch, December 20, 2012 “Amnesty International orders official Kristyan Benedict to apologise for ‘antisemitic’ tweet,” The Jewish Chronicle, available at http://www.thejc.com/news/uk-news/94787/amnesty-international-orders-official-kristyan-benedict-apologise-antisemitic-twe. Marcus Dysch, “Amnesty International defends official accused of anti-Israel bias,” The Jewish Chronicle, July 19, 2012, available at http://www.thejc.com/news/uk-news/70222/amnesty-international-defends-official-accused-anti-israel-bias. 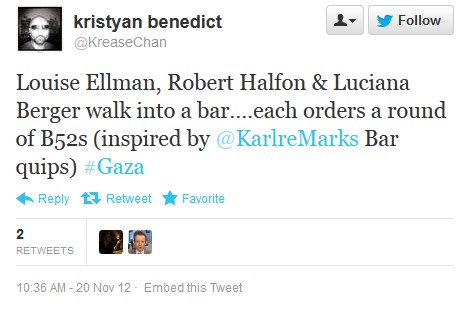 @KreaseChan, Twitter, November 19, 2012. For a list of other tweets, please see NGO Monitor, November 21, 2012. “NGO Warfare Update: Amnesty Launches Frontal Attacks” available at http://www.ngo-monitor.org/article/ngo_warfare_update_amnesty_launches_frontal_attacks_. Marcus Dysch, “Amnesty International orders official Kristyan Benedict to apologise for ‘antisemitic’ tweet,” The Jewish Chronicle, December 20, 2012, available at http://www.thejc.com/news/uk-news/94787/amnesty-international-orders-official-kristyan-benedict-apologise-antisemitic-twe. AIUSA, Country Specialist Job Description, available at http://www.amnestyusa.org/sites/default/files/countryspecialist_jobd.pdf. See Edith Garwood, “Policy on Iraq Exposes Hypocrisy About Israel,” Oct 23, 2002, Miftah.org, available at http://www.miftah.org/display.cfm?DocId=1148&CategoryId=5, specifically her Bio. According to Id. This seems to now function under the title Coalition for Peace With Justice. The Coalition for Peace with Justice, “Who We Are” available at http://peace-with-justice.org/about/. Blaise Strenn, Events for the Week of January 10, available at http://groups.yahoo.com/neo/groups/ncsudemocrats/conversations/topics/595. Action Center For Justice, “Oct. 12: ‘Reality on the Ground: What About Human Rights’” available at http://charlotteaction.blogspot.co.il/2011/10/oct-12-on-ground-what-about-human.html. Edith Garwood, “Let the Refugees Return,” Charlotte Observer, April 11, 2008. Edith Garwood, “Verdict Expected in Death of Rachel Corrie,” 27 August 2012 available at http://blog.amnestyusa.org/middle-east/verdict-expected-in-death-of-rachel-corrie/. Creative Loafing, April 30, 2003, Letter to the Editor available at http://m.clclt.com/charlotte/going-postal/Content?oid=2351209. Gaza’s Ark, “Who We Are,” http://www.gazaark.org/about-us/who-we-are/. Email to GazaArkUS Google group, 24 May 2012, on file with NGO Monitor. Email to GazaArkUS Google group, 12 June 2012, on file with NGO Monitor. Benjamin Weinthal, Jerusalem Post, “Amnesty Int’l Finland: Israel scum state,” 08/24/2010 available at http://www.jpost.com/International/Amnesty-Intl-Finland-Israel-scum-state. Sanjeev Bery, February 14, 2011, “Arab Freedom Is Good for Israel,” available at http://www.huffingtonpost.com/sanjeev-bery/arab-freedom-is-good-for-_b_821739.html. Sanjeev Bery, October 4, 2010, “Turkish Foreign Minister Slams Israeli Settlements in Harvard Speech,” available at http://www.huffingtonpost.com/sanjeev-bery/harvard-turkish-foreign-m_b_744767.html. Sanjeev Bery, June 18, 2009, “Israel’s Ban On Crayons,” available at http://www.huffingtonpost.com/sanjeev-bery/israels-ban-on-crayons_b_217215.html. On August 17, 2015, a series of articles published in the Times (London) revealed that Yasmin Hussein, currently Amnesty Internationals Director of Faith and Human Rights, has links to the Muslim Brotherhood and possibly to Hamas.